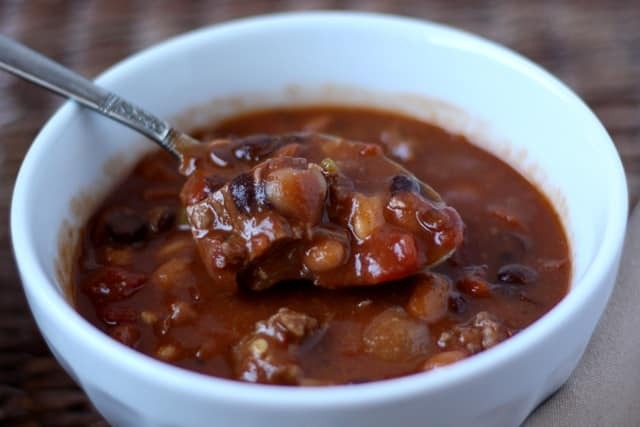 Spicy Five Bean Chili filled with steak and sausage is a family favorite all winter long. Start it in the morning and let it simmer on its own all day. Does anything smell better in the fall than a spicy pot of chili simmering on the stove? Last year, my friend Shannon brought a huge pot of chili to an event and it was absolutely perfect. I’ve been making chili for years and mine was never bad, but it was also never amazing. I pestered her for the recipe and she was sweet enough to send it to me. I could not believe that our recipes were virtually identical save for one ingredient. That one ingredient though? It made the difference between an “okay” chili recipe and a chili that can knock your socks off. THIS chili makes me happy. It makes me grin when I smell it throughout the house and I look forward to dinner all day long. Whether I make it on the stove or in the slow cooker, the smell of cooking chili brings so much joy and comfort to my day. Tender steak, spicy sausage, five different varieties of beans, tomatoes, and chilis all combine to make this a spectacular chili. Don’t be fooled by the long list of ingredients! This is a very simple recipe and doesn’t take long at all to throw it together in the morning. I like to let it simmer on low most of the day if possible. Letting it simmer for hours really gives a chance for all the flavors of the steak, sausage and chilies to mingle. I almost always grab a bowl of this chili for lunch if I start it early enough. I just can’t resist. 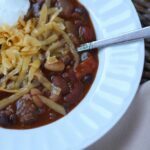 This Steak Chili Recipe is similar to many other chili recipes I’ve tried, with the exception of one ingredient. That ingredient makes all the difference in the taste. The ingredient is the Ranch Style Beans! They’re tossed in with all the other beans and something about them is just magical. I kid you not. I had never bought Ranch Style Beans before in my life. I have tried unsuccessfully to recreate the flavor and taste from scratch for the past year and I haven’t even come close. If any of you have found a way to create that taste at home, I would love to hear about it. Ranch Style Chili beans are full of delicious spices that just work so well along with the sausage and steak in this recipe. It’s really worth using Ranch Style Beans in this recipe! I’ve made my share of chilis with chicken, several with ground beef, and even Vegetarian Chili. Steak Chili has a distinct flavor and texture that you don’t get from chili made with other kinds of meats. I also like using spicy sausage in this recipe, cooked to perfection and crumbled. 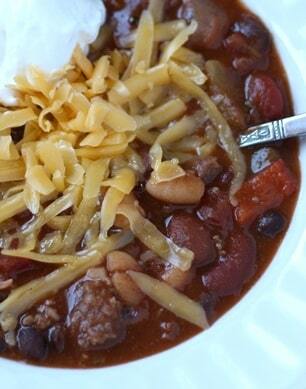 This Five Bean Steak and Sausage Chili is good however you like to eat your chili. Serve over baked potatoes, macaroni, or rice or alongside a thick slice of cornbread. It’s delicious topped with cheese, sour cream and Cornbread Croutons, or enjoyed all on its own. Trust me, this chili is delicious every which way! This recipe starts by cooking your steak. The way you cook the steak doesn’t matter too much. You can grill, broil or cook the steaks on the stove and they will turn out just fine. I usually like to season my steak with salt, pepper and garlic on each side while it cooks. Once the steak is done, simply add it to a large stock pot with all your other ingredients and bring the whole thing to a simmer. Let it cook at a simmer for 4-6 hours at least, or on low heat all day long. In my experience, cooking this chili for a longer time over lower heat results in the best flavor. So even though you might be tempted to dig in after a few hours, try to resist! The longer is simmers on the stove or in the crock-pot the better it will be! In case you can’t tell at first glance, this is a HUGE recipe. It can serve my whole family with plenty leftover. This makes it a great dish to make for parties and big family gatherings. I usually make the full batch and then freeze it in large and small containers for full family meals and for individual lunches. No one ever regretted having extra chili in their freezer! Spicy Five Bean Steak Chili is even better the next day, so I often make it ahead of time and then warm it up on the day I want to serve it. It heats up beautifully on the stove top or in the microwave. This recipe could easily be reduced to make less chili but I enjoy having it in my freezer whenever possible, so I rarely make a smaller batch. I figure if I am going to let it simmer most of the day, I might as well get several meals out of it. If you are making this chili in a standard sized crock-pot, you will need to reduce the recipe by half to fit! More chili recipes on this site you might love are Hearty Pepper Chili, Tomato Chicken Chili, and Creamy White Chicken Chili. If you’re after a chili recipe without beans, give this Slow Cooker No-Bean Chili by Sugar-Free Mom a try. Kitchen Tip: I use this pot to make this chili. 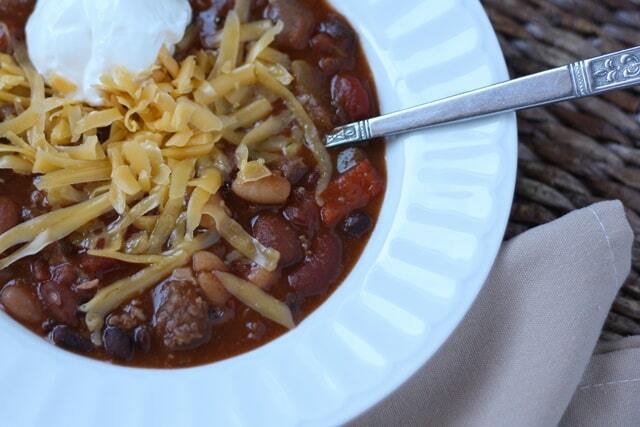 Spicy Five Bean Chili filled with steak and sausage is a family favorite all winter long. Cook your meats as shown above and add them to a very big pot. Add all the other ingredients listed and stir to combine. Bring to a simmer over medium high heat, stirring occasionally and then reduce heat to low. Simmer (actually, mine doesn’t quite simmer, but I like it best that way on low heat) all day or at least 4-6 hours. I stir mine every couple of hours and try to resist the urge to eat it all day long. Serve topped with cheese and sour cream for the perfect fall meal. Enjoy! half to make less chili. then reheated on the stove-top. I am in the chili mood lately - this one looks wonderful! Looks like the perfect fall meal to me! Delish! This looks right up my alley! I love simmering a big pot of chili all day. The house smells fabulous! I can't believe it was the Ranch Style Beans. I don't think I have ever used those before. I will for sure now! It is rainy and cold over here...this chilli dish looks perfectly hearty, warm and tasty! My husband loves chili, and I'm sure he'd die for one with steak AND sausage! This looks perfect! dang, that looks so much better than the chili we just made and ate tonight. Fantastic chili. ROFL, when you say BIG pot, you aren't kidding! I recommend an 8Qt pot because my 6Qt is about to overflow with 16 pounds of chili. :D But I'm a-pickin', and I'm a-grinnin'. YUM. Thank you so much for that link! I just printed the recipe to try soon. Thank you!! YES! When I make this, I use a HUGE pot. I usually make it in a 12 or 16 quart pot, because I hate it when a pot is close to overflowing. I might be able to get it all in my 8 quart, but I can't imagine how it fit in your 6 quart! I hope you love it. Please feel free to enter my giveaway for a free year subscription to Everyday Food Magazine! I am visiting my friend and using her computer. Yesterday Lisa and her neighbors had their 2nd annual Chili Cook-Off. This was the first one I attended. There were 8 entries. One of those entries was mine. I chose to make a vegetarian chili which was nice but unless you are a vegetarian per se you probably want meat in your chili. Lisa chose to make the aforementioned Spicy Five Bean Chili with Meat and Sausage. To give you the bottom line I can say that Lisa won the contest and that was after much chili eating. Remember, there were 8 different Chili's. Lots of beans for all. In fact ,everyone who attended the event could now be considered a Weapon of Mass Destruction. No one should light a match anywhere near New Hampshire for a few days. All of the chili's were decent but Lisa's was overwhelmingly the best. The right hit/hint of spice and her meat remained soft unlike all the others who used either beef or a meat that did not take so well to long term cooking/crockpot. The sausage/flank steak combo was right on and the mixture of beans was a little out of the ordinary. This is on my list the next time I go to make chili.